Where do I manage my Partner commissions? If you haven’t setup your Partner Program, start here. 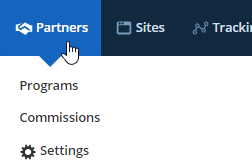 If you’ve already setup your Partner Program, go to the Navigation menu > Partners > Commissions. When a Partner refers a product(s) and makes a sale, that commissionable sale appears in the Pending Commissions subcollection. There are a number of actions you can perform on a pending commission. Select one or all of the pending commissions listed to apply the following actions. Approve - Approve the commission. Once a commission is approved, the referring Partner will be eligible for payment when they reach their pay threshold. Email - Send an email to the referring Partner regarding the sale. Export - Download a CSV file of all the pending commissions. This is useful for separate review of the commission. Cancel Commission - Decline the commission for a particular sale. If this is done in error, you can re-run the commission on the sale from the Contact Record to reinstate the commission. Once you’ve approved a commission for a Partner in Pending Commissions the sales totals of a Partner aggregate into one line with the amount they’re owed in the Pending Payments subcollection. There are a number of actions you can perform on a pending payment sum to a Partner. Select one or more entries to perform these actions. Pay Partner - Mark the commission "paid". This has no action other than marking it paid in ONTRAPORT. You will still need to pay the Partners. This does not pay your Partners automatically. To pay Partners you either use the Download PayPal CSV option below to pay them via PayPal, Export the commissions using a regular CSV file for import into your accounting software, or issue manual payment via a check, etc. Email - Send an email to the Partner regarding payment. Download PayPal CSV - Export a PayPal MassPay CSV that you can upload into PayPal. Export the commissions in a regular CSV file for import into your accounting software. Once you’ve approved a commission or paid a Partner, that data will appear in the History subcollection. Here you can view all approved commissionable sales as well as all payments you’ve made to your Partners. You also have the ability to perform any action that can be done on a pending commission here (see 'Pending commissions' above). The Partner system extends into the contact record in that you can open up any contact record in the Contacts Collection and view/edit Partner details in the Referral Info tab. In the Referral Info tab you can view, manually configure, or edit the Partner fields of a particular contact. These fields include First and Last Referrer, Partner Program, and PayPal Address. You can also view how many sales as well as the total amount of sales your Partners have made. The data populated in those fields can be used to trigger Rules to automate actions such as notifying Partners when they’ve made a sale, rewarding Partners, or much more. You can create groups and filter your Partners in the Contacts collection. This is done by creating a group based on one or more of the Partner fields (referenced above) in the Contact Record.